Dr Lupač’s monograph Beyond the Digital Divide: Contextualizing the Information Society revises the existing research of the digital divide, i. e. the relation between the use of the Internet and social inequality, and its key thesis that unequal acess to the Internet has become the new source of social inequality. Dr Lupač presents the foundations of the theory of the information society and its current most influential versions. 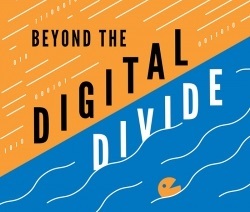 Based on a systematical presentation of existing research in this area, he identifies and analyses six prerequisites present in the prevailing understanding of the digital divide. The book concludes with a proposition of a new, contextual approach to the digital divide and with a consideration of the implications of this approach for information policies, the theory of the information society, and the role of the social sciences in the process of informatization. The monograph is an updated, globalised version of the Czech original which came out in 2015 from SLON Publishing. Download the first chapter of the book for free. Mgr. Petr Lupač, Ph.D., has been teaching at the Department of Sociology, CUFA, since 2008. He has participated in research stays at the University of Liverpool, Kansas State University and New York University. He focuses on the questions of technology, new media, and globalisation. Since 2015, he has served as consultant during the preparation and implementation of the Czech Strategy of Digital Literacy for 2015–2020. He is the Czech representative of the World Internet Project.